Sean J Vincent Blog: Sony FS700... wow. So here it is... Andrew Reid from EOSHD was right... Sony have just announced the FS700, a new model in the Sony Large Sensor range. The best news for me? 10bit 4:2:2. Result. That's all i've been waiting for. No more 8bit banding. EDIT>> Hmmm...turns out it's still 8bit padded to 10bit... shame. But the SDI output should give us 12bit 4K at some point...which is interesting, although highly likely to be a pretty expensive bit of hardware to capture it. As you can see, there's an ND wheel at last... so all those ENG guys can stop whinging. There's also a re-designed handle that looks a bit better than the FS100 one. Biggest news for out-of-the-box-niceness.... has to be the slow-mo capabilities. That's reason enough to buy it for me. And how much is this thing going to be? Well, in the US it's apparently going to be under $10k. So expect $9999.99... which will probably mean £9k over here in the UK. The camcorder delivers Full-HD quality images at 120 and 240 frames per second in an 8 or 16 seconds burst mode respectively. The NEX-FS700’s high sensitivity and low noise shooting capability makes super slow motion shooting more convenient without additional equipment. 480 fps and 960 fps rates at reduced resolution are available for faster frame rate recording. The NXCAM’s E-Mount flexibility is designed to accept virtually all SLR and DSLR 35mm lenses, with the use of simple, inexpensive adapters without optical degradation. FS series owners can make use of their existing lenses and add more lenses without being forced on a brand or mount. Users can capture high-quality still images with the NEX-FS700. The camcorder also includes face detection and auto focus to help ensure the subject is always kept in focus. NEX-FS700 operators can take advantage of the camcorder’s built-in ND filters, with a newly designed wheel that rotates across the sensor like a turret. The wheel includes positions for Clear, 1/4 (2 Stop), 1/16 (4 Stop), and 1/64 (6 Stop). The camcorder is 60/50Hz switchable to give people the freedom of working in any geographic region without being restricted to only PAL or NTSC recording. The NEX-FS700’s 3GHD-SDI and HDMI connectors can output Full-HD 50p and 60p, in addition to standard HD 60i, 24p, 25p or 30p frame rates with embedded time code and audio. 3G HD-SDI can output native 23.98, 25, 29.97 progressive signals; users can choose to output PsF over the 3G HD-SDI. Thanks to flexibility of the digital ports virtually any external recorder can be connected. Users can save up to 99 camcorder profile settings on a memory card and can copy the same setting to multiple units. 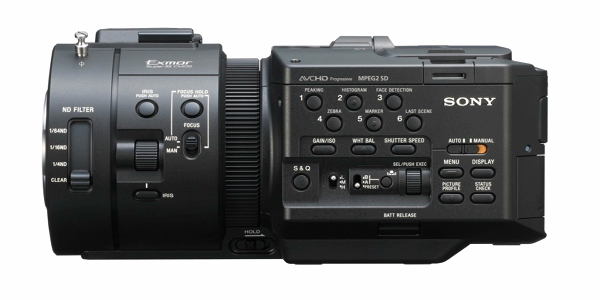 Compatible media includes MS and SD memory cards and Sony’s HXR-FMU128 flash memory unit that attaches to the camcorder. The NEX-FS700 features include a robust detachable top handle, secured by a pair of screws (a cold shoe, plus two sets of 1/4 and 3/8 inch holes) that allow heavy accessories to be mounted. The handle is attached with a rosette mount. A key element of the handle is an “active grip” that features four buttons for commonly used functions – expanded focus, auto iris, still capture and Recording Start/Stop – so users can easily operate the camcorder while holding it. Function buttons are also enlarged to make operating easy, even while wearing gloves. 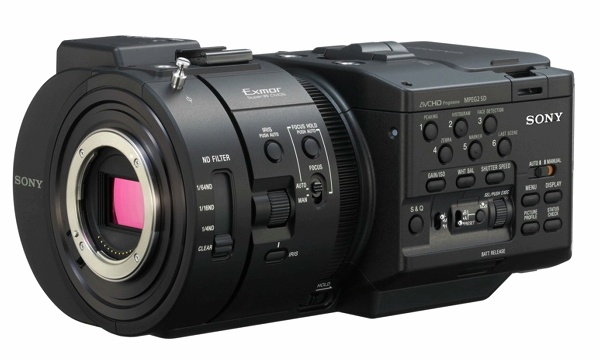 The camcorder’s enhanced durable design also includes anchor points for compatibility with third party accessories. Sony is planning a future firmware upgrade that will enable the NEX-FS700 to output 4K bit-stream data over 3G HD-SDI when used with an optional Sony 4K recorder. 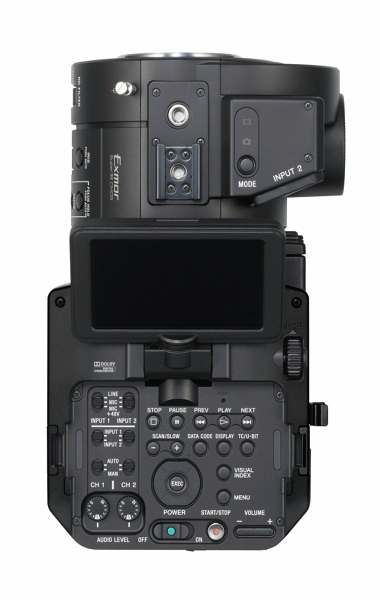 The NEX-FS700 is planned to be available in June 2012. 5D Mk3 and the ongoing camera wars.